The fall season is known for cooler weather, leaves changing colors, football, apple picking and pumpkins. With Thanksgiving upon us this week, I also can't help but think of family, turkey and pie. Another traditional symbol of the upcoming holiday is the cornucopia. A cornucopia is often used to represent the harvest and fall's abundance. Frequently depicted in classical art, it is a cone-shaped object overflowing with fruits, grains and/or vegetables. Below are five locations where this "horn of plenty" appears in the U.S. Capitol. 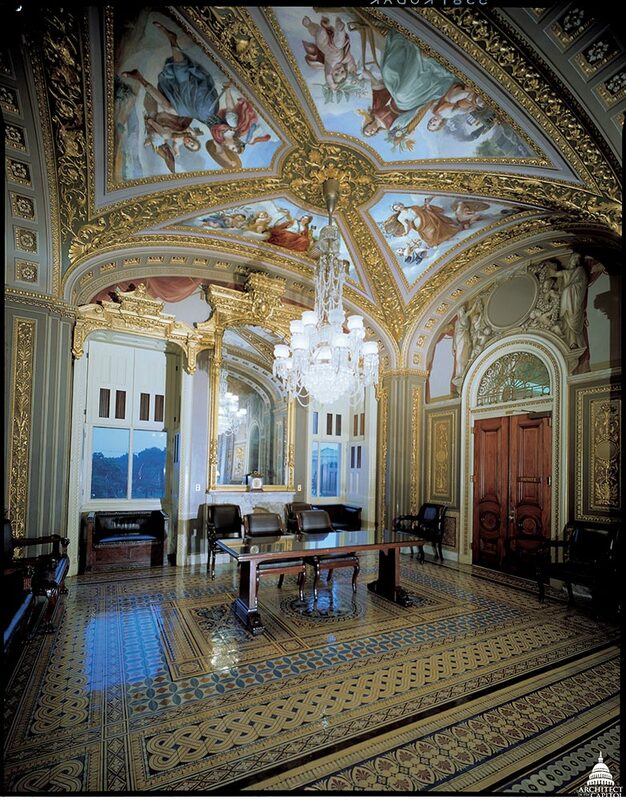 The decorations in this room are by Costantino Brumidi and were the first fresco decorations in the U.S. Capitol. 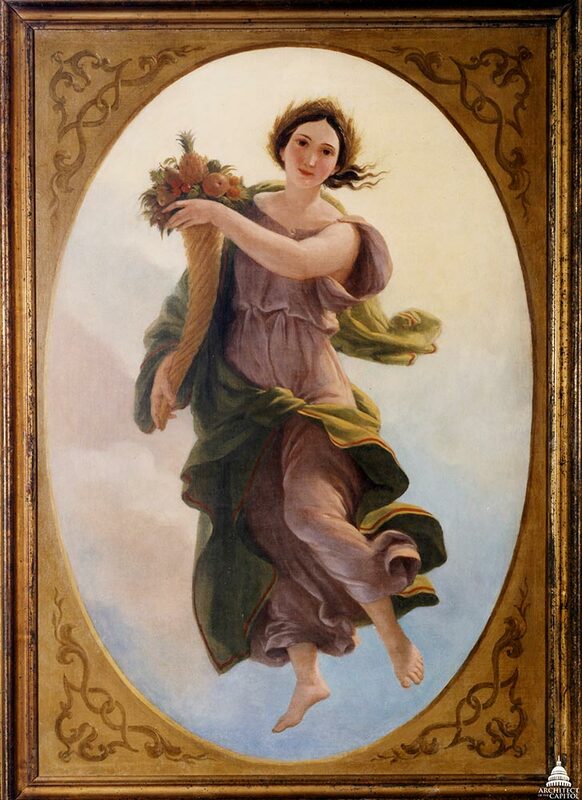 They were painted when the room was occupied by the House Committee on Agriculture Room, so it’s fitting that the cornucopia is part of "The Four Seasons" on the ceiling. 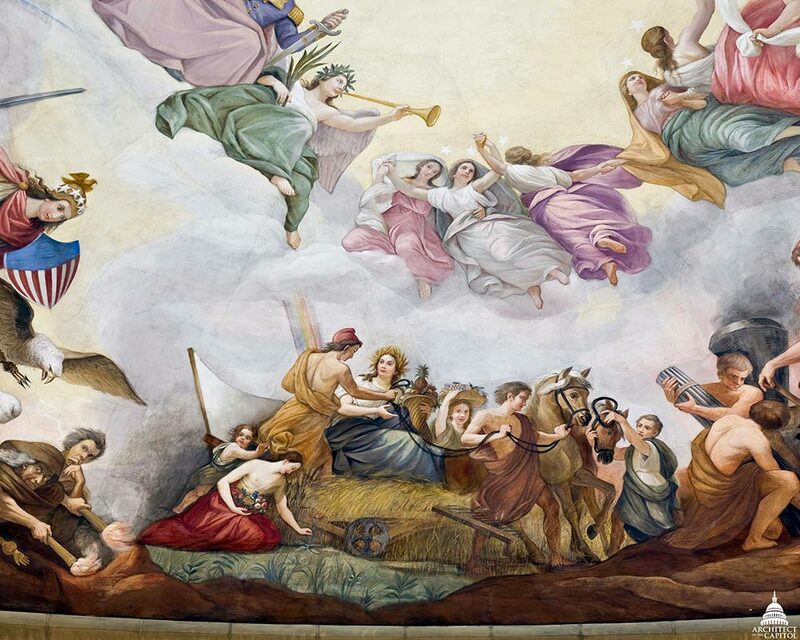 Looking up again, one can spot Ceres, goddess of agriculture, in the "Apotheosis of Washington." She holds a cornucopia as she is handed the reins for horses pulling a reaping machine. This oil on canvas of "Plenty" by Brumidi was donated to the U.S. Capitol in 1994. It is currently hung near the bronze staircase of the North Corridor named for the artist. 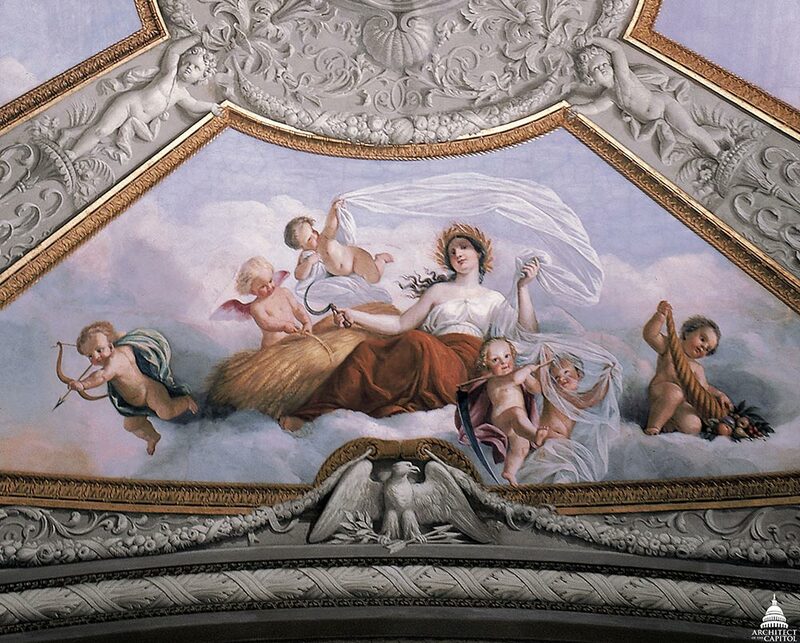 "Plenty" appears once more in a ceiling vault on the north end of this room, where she is joined by the other allegorical figures of "War," "Peace," and "Freedom." The south wall of this room features a lunette with a portrait of George Washington. His right is flanked by a figure representing Peace and she rests over a cornucopia. The cornucopia is much more than just a decoration for the table, ceiling or wall. It represents our thankfulness for all of the good things in life. Bonus Cornucopia: cover photo is the lunette “Telegraph” by Brumidi in the now Lyndon B. Johnson Room, S-211. Again thank you for this wonderful trip thru our Capital.